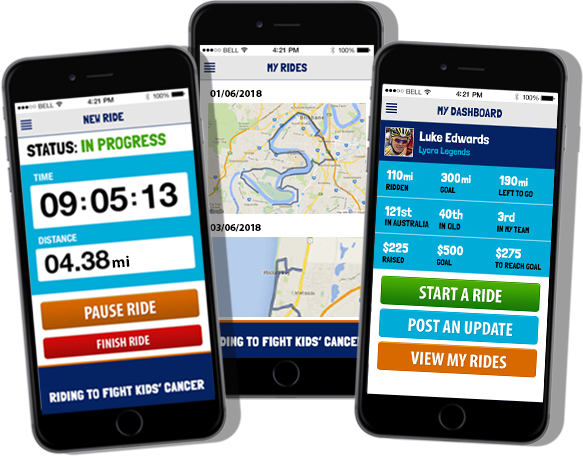 The Great Cycle Challenge app will record your miles, provide ride details and map the route for each ride you complete throughout the month of June. Login to your dashboard and connect your GCC account with your existing Strava OR MapMyRide profile. Please note: While you can practice recording rides prior to June 1 using the app, we will be removing all rides completed up to 11:59 pm on May 31. Great Cycle Challenge USA's mobile app is available for iOS (Apple) and Android (Samsung et al.) smartphones and can be used to track your miles throughout June. The app is compatible with iOS 7 onwards plus Android Version 4 (Jelly Bean) and above. Select 'United States' from the country drop down before trying to sign-in - regardless of whether you are signing in with a username or via Facebook Login. You must log in to the app using the same username and password you created for your ride account (when you registered) or via Facebook Login if you signed-up using Facebook. Make sure you have the GPS on your phone enabled in order to track the distance you ride - the app will notify you if it is not enabled. Each ride will be automatically added to your ride profile page. The app is only available for iOS and Android platforms - Windows, Blackberry and other platforms are not supported. Those using an exercise bike or similar to complete the challenge can add their rides using the 'add ride manually' function. While you can record a ride prior to June 1 using the app, we will be removing all rides pre-11:59 pm on May 31. Do you have a question about the app? See our help center for all the answers.